We don’t always publicly share the feedback that we get from our Brides and Grooms and their families, but over the years, we’ve received many words of thanks, praise and encouragement from many couples. 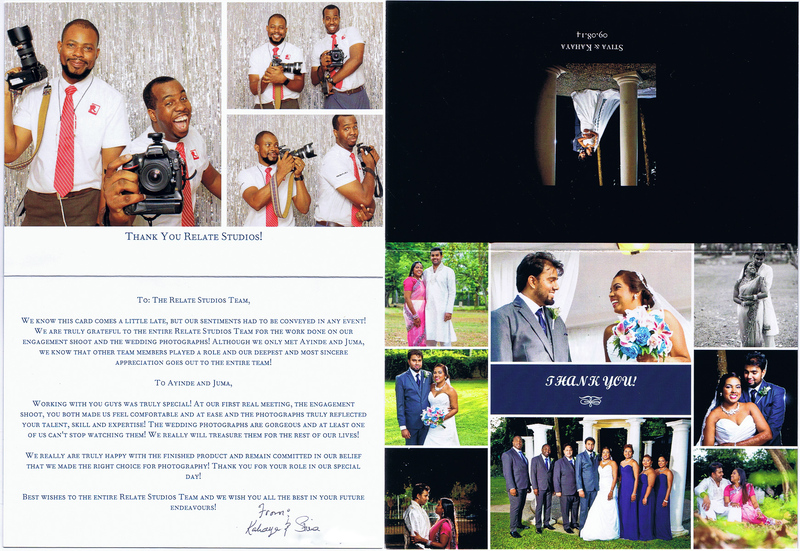 However, the Thank You card we received from Stiva & Kahaya after we shot their wedding, stood out and has become very special to us for two reasons. 1. This is first card we’ve received with photos of ourselves in it (Thank goodness we jumped into the photobooth). and 2. The words Stiva & Kahaya used, very powerfully captured the team and collaborative aspect of Relate, because even though they didn’t meet everyone on the team, they were able to see how important all of the individual team members are in making Relate Studios who it is, so everyone got thanks and appreciation. I couldn’t have said it better myself. Stiva & Kahaya we appreciate your insight and your understanding of how Relate works, you truly are a Relate couple! You can see their beautiful card below.